Sometimes we change our mind. Find out how to do that with the least impact. If you've decided you don't want to continue serving AMP pages to your readers, for whatever reason, it isn't just as simple as removing the AMP plugin from your site. Deleting the AMP plugin will cause 404 errors on your AMP pages. All of them. Having 404s on your site is not a great idea for SEO. Neither is having a site-wide redirect if you ever want to potentially go back to running AMP. You'll get infinite 301's, which is DEFINITELY not good. When one of our publishers decided that they didn't want to run AMP anymore, we had a really hard time finding a good solution for flipping off the AMP switch, so we created one and added it to our Mediavine Control Panel plugin. By ticking this box, you are telling the Mediavine Control Panel plugin to remove the "<link rel=”amphtml” />" code from your regular pages. Then, as the pages get reindexed by Google, they'll fall off the radar and Google will stop sending traffic to them. This process can take a while, and varies from site to site. You'll want to keep both the AMP plugin AND the MCP active in your Wordpress setup though. We have not tested the impact of removing those after all of the AMP pages are no longer indexed. 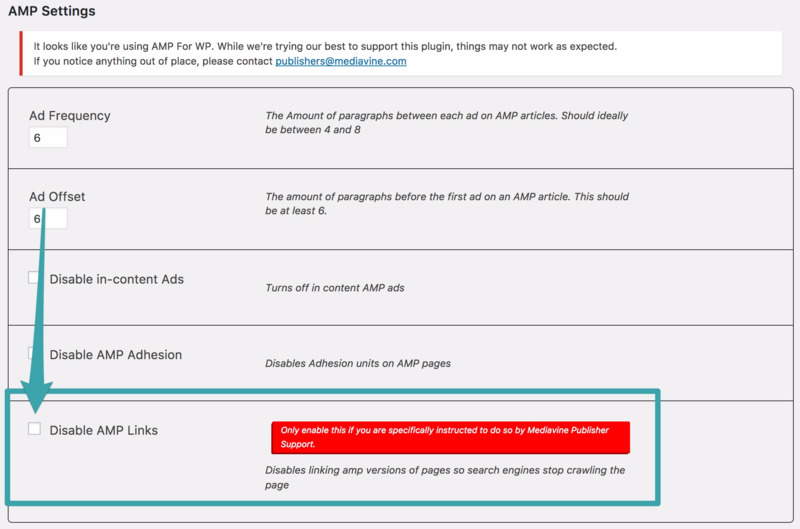 IMPORTANT NOTE: For those using AMP for WP, we ask that you disable that plugin and install AMP by Automattic instead before starting the process. In your Mediavine Control Panel plugin, tick the "Disable AMP Links" option. Save. Wait. This part isn't fun, but we need to wait for Google to de-index the AMP pages. You can check this in your Search Console in the AMP section. We also recommend using the Mediavine AMP Redirect plugin so that you can see the immediate benefits of rolling back your AMP pages. Check your Google Analytics to see if you are getting any traffic to AMP pages still. You can also see this in your Mediavine dashboard settings area if you are tracking your AMP analytics there. Once you have 0 indexed AMP pages, visit your Wordpress Plugins page. You can disable your AMP plugins after you have gotten ZERO pageviews to your AMP pages for an entire month. IF YOU ARE NOT GETTING ANY AMP TRAFFIC AT THIS POINT, STOP HERE. Leave the AMP plugin running until you have gotten ZERO pageviews to your AMP pages for an entire month. If you are still getting AMP traffic now, and you have 0 indexed AMP pages, it is probably coming from Pinterest. This is a known issue that Pinterest is aware of. At this point, we'd recommend installing the Mediavine AMP Redirect plugin. This will 302 redirect any traffic from your AMP pages to the non-AMP equivalent.